On 29 of Novemer the last lesson in school "Epigraph" was devoted to Japanese culture. There were organized 6 different workshops. 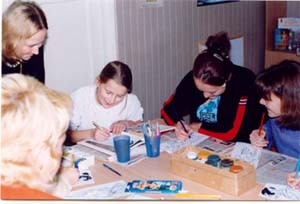 Students had the possibility to choose the workshop according to their likes. 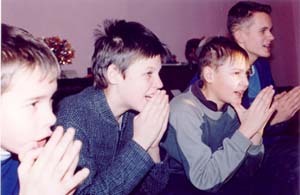 Students were devided into three groups. 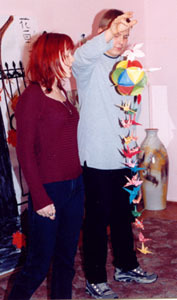 One group made Japanese cranes, the other made butterflies from paper, and the last one constructed a big paper ball. The construction symbolised our world. Diferent colors of the ball symbolized different continents, buterflies symbolised freedom and cranes symbolised kidness. 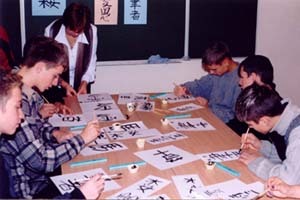 Students studied the system of education in Japan and Japanese alphabet. Then they wrote real Japanese ierogliphs that meant "snow", "flower", "grass", "bird" and finally "patriotism" that consists of three ierogliphs: "love", "country" and heart. Finally, students made four big banners from their ierogliphs. They tried to make some phrases from the written words. 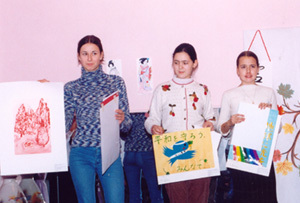 Students studied the theory of writing traditional Japanese poems haiku. Then they chose a drawing on the exhibition and wrote a poem about it. On this workshop students studied the history of the traditional Japanese holiday Hinamacuri that is devoted to girls and dolls. Then girls watched pictures of Japanese women in traditional costumes and tried to draw their own doll in kimono and to imagine the story about that doll. The workshop "Scream of Samurai"
While the previous workshop was for girls this one was visited completely by boys. There was a game for two teams. They had to solve math problems, to train their memory and physical abilities, to check their knowledge of Japanese cars and so on. At the end of the game boys had to scream "Good Morning!" on Japanese and they became samurais. After all workshops students had a Japanese lunch. 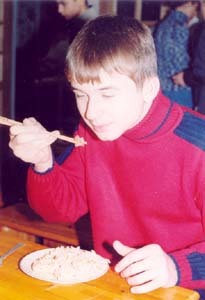 They had to eat Japanese meal rise and salad with chopsticks.